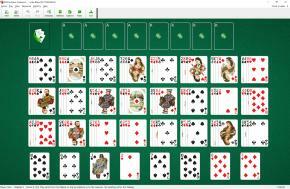 Little Billee Solitaire uses 104 cards (2 decks). 24 fans (four cards in each) are placed on the board. You also have 8 reserve piles. At the start of the game 1 card is dealt to each reserve pile. An Ace and King of each suit are moved to the foundation piles during play as they become available. Only the top card of each fan is available to play to the foundations or to the reserves. You cannot move cards from one fan to another. Empty fan cannot be filled. Each reserve pile may contain only one card. This card can be held in reserve until it can be built to the foundations. You cannot move cards from the reserves to the fans. 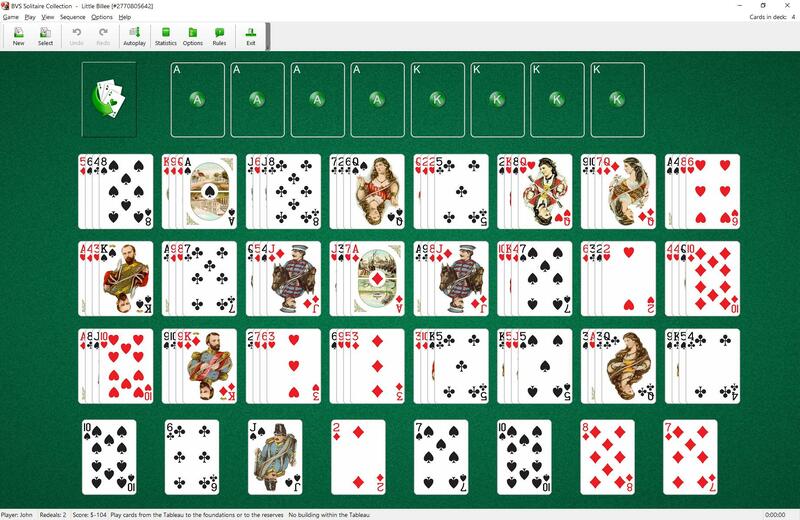 When you have made all the moves initially available, click on the empty stock pile to restack the cards. During restacking all the remaining cards are first gathered together and dealt out into fans with 4 cards in each. This game was described by Mary Whitmore Jones.